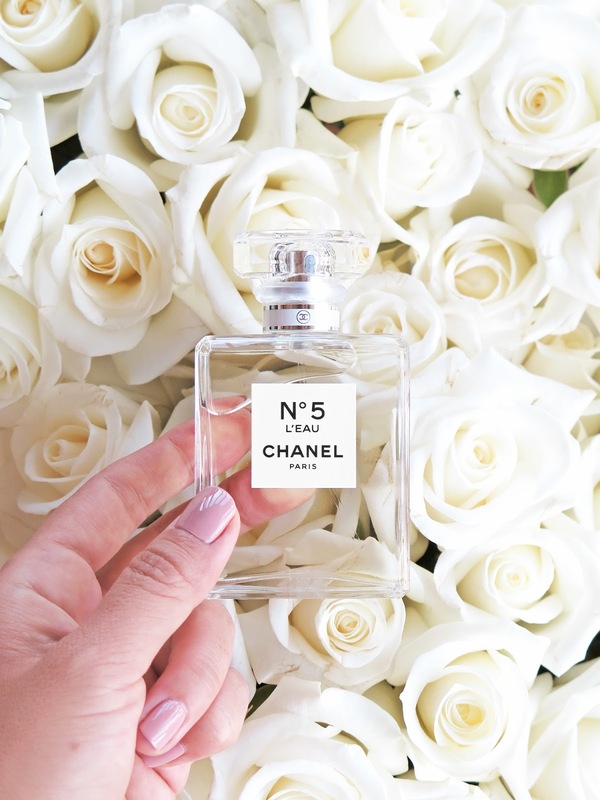 Today I have a few picks from a couple Chanel collections for fall. There are a series of new product launches, the first being the Le Rouge Collection N°1 and second being the Ultrawear Flawless Foundation Collection. I’ve been a long time fan of Chanel beauty and the fall launches are usually the ones I look forward to the most for new innovative products and shades that have a modern twist on classic colors. This year’s launches so far fall short of my expectations in terms of innovative colors and I found the options this year to be some of the most boring and unoriginal shades I think I’ve ever tested. I will admit that I do believe there are only so many ways to do red – perhaps at this point it’s already all been done? The quality for the most part is still excellent and I did find some things I have been really happy with – in general though, I feel the Chanel fall launches lack excitement, especially compared to previous collections. In addition to the first color launch for fall Chanel a new foundation called Le Teint Ultra Tenue Ultrawear Flawless Foundation which is a fluid long-wear formula. The powder foundation has also been reformualted to a new silky formula called Le Teint Ultra Tenue Ultrawear Flawless Compact Foundation. I got a small sample of the liquid in shades 30 and 40 (my usual colors) to test. 30 is an almost perfect match, just a tiny bit too pink on my skin. It blended seamlessly on my skin, gave medium natural coverage, had impressive lasting power and stayed put all day without getting oily or patchy. The only down side is by evening I saw tiny little bumps surface along the sides of my face. After testing two days I saw bumps get worse so I suspect I am allergic to it which is a shame because it wears so beautifully. I have not yet tested the powder foundation but hope to go back to the counter soon to do so. There are two new blushes featured in this collection called Evening Beige and Rosewood which are not the baked formula (yay!!). More details below as I work my way through the colors I picked out from the two launches. Up first are the three blushes. All three are the regular US formula which I prefer over the baked formula you’ll find in other countries. These are soft, finely milled, smooth powders that are easy to dust on the skin. All three are darker so if you’re medium-tan to deep in skintone and have found most Chanel blushes to be too light to show up, you will rejoice that Chanel has finally launched colors that will show up on your skintone! The pigment is quite intense so a super light hand is needed. I found the red in Rouge Profond to have an almost vintage feel. For my skintone I need a very light hand to be able to wear this and one swipe too many results in a clown-like look and almost burnt on my skin (scroll down to the bottom for a look). 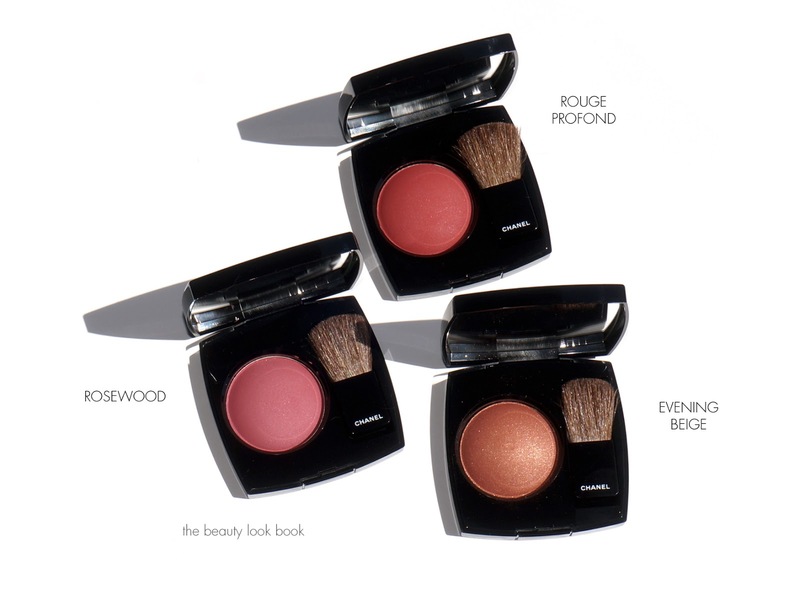 For the two blush shades in the foundation launch, so far you can find them both online at Chanel and Neiman Marcus. At the moment, Nordstrom only has Rosewood and not Evening Beige. Rosewood is lighter and easier to wear compared to the fall red, but the intensity is still a bit much for me. By comparison I’ve just been completely blown away by the Marc Jacobs Beauty Air Blush (yes they’re very expensive but are amazing, review soon) which looks better on the skin compared to these. Last but not least, Evening Beige is probably the one unique shade of the bunch – it’s a warm coppery shimmer. I don’t really see beige in it, but I suppose one could call it a coppery beige. My personal preference is for the Golden Sun blush which is less warm and more of a beigey color. Next is the Rouge Allure in Rouge Ingenue. Most of the colors launched are variations of red and this was the only light neutral. The color is a light beige cream which is absolutely gorgeous. Unfortunately the color went on my lips patchy and required a lot of blending, blotting and reapplying to get smooth application. I found this odd since I’ve had great success with most Rouge Allure lipstick formulas – I suspect the paleness of the color might have played a part in my application issues. Swatch comparisons below for some similar colors. Last but not least the items I usually get the most excited about, the nail colors. There are two in the Le Rouge Collection N°1, one is the Le Vernis in Rouge Puissant which is a deep red cream. This one is almost identical to the discontinued Dragon, the Rouge Puissant is just a tiny bit darker. Once dried on the nails it deepens in color and appears to be a dark red that ages my hands. I would say unless you’re a Chanel collector, pass on this one. The other color is a Nail Gloss formula called Rouge Radical which is a transparent jelly red. I did not know what to expect with this one and was pleasantly surprised to find how opaque and pigmented it was once on the nails. 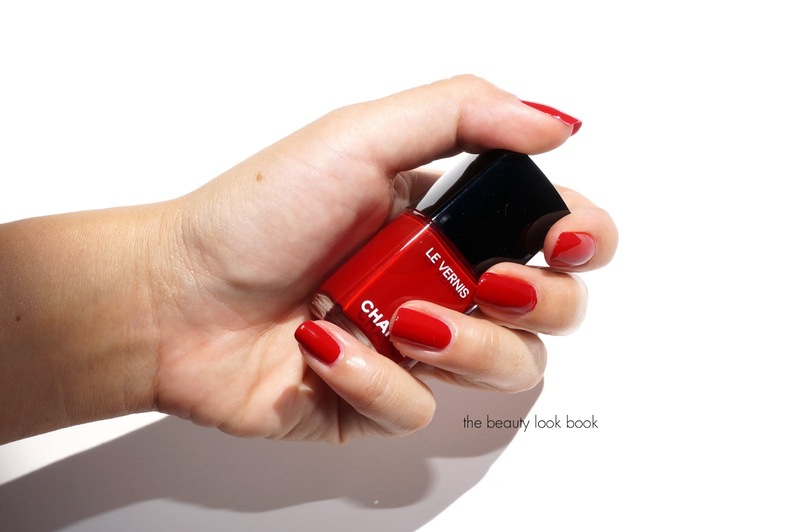 Even though it has a transparent formula it covers the nail entirely for a bright red look. I absolutely love this one and by now it has already sold out at many locations (you can still find it online at Saks, Macy’s, Bloomingdale’s). 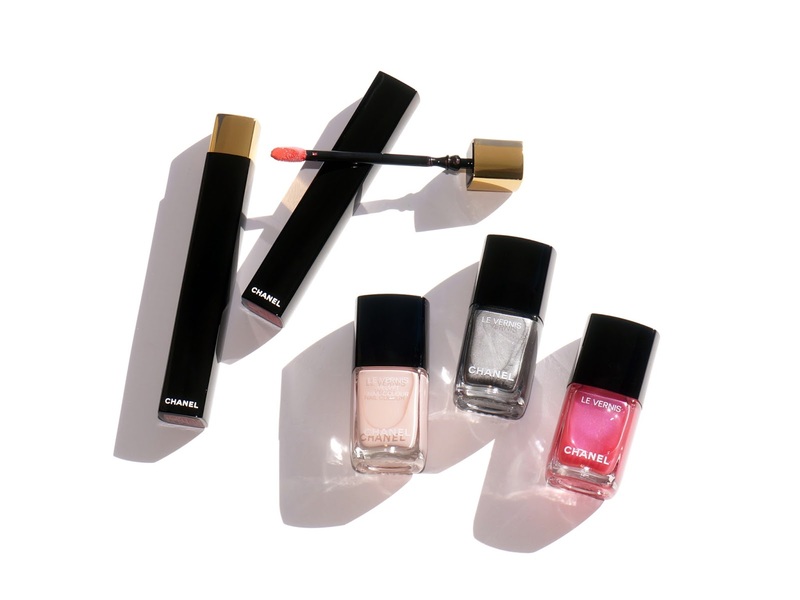 Stand outs to me include the Nail Gloss in Rouge Radical and Joues Contraste in Evening Beige. I had high hopes for the new foundation but unfortunately caused tiny bumps to form so it’s a no-go for me. I passed on a lot from the the reds collection – I think red is hard for me to pull off, especially on the eyes which seemed to be a heavy focus for the illusion d’ombre, quad and liners. The rest just wasn’t really my cup of tea color-wise, but quick swatching at the counter showed the quality to still be on point. I do think the Rouge Profond blush is unique even if I think red blush is a bit boring – I keep hoping it will grow on me, but I have to apply with a very careful light hand. Even then, sometimes after it sets and warms on my skin the color darkens so I have to go back with my powder brush and blend along the edges. I’m usually hesitant to post negative reviews because I don’t want to offend anyone, especially in this case if you loved the pieces in this collection. I want to reiterate that products are great quality-wise, for reds I would have been head over heels had Chanel relaunched previously discontinued colors like Cosmic Violine, Tulip Noire or something that I feel are a bit more special. Do note that many of the pieces in the red collection are limited-edition and some have already sold out online. You may have to do a bit of shopping around to find all the items if they’ve been on your list so I do recommend buying sooner than later if any of the colors speak to you. 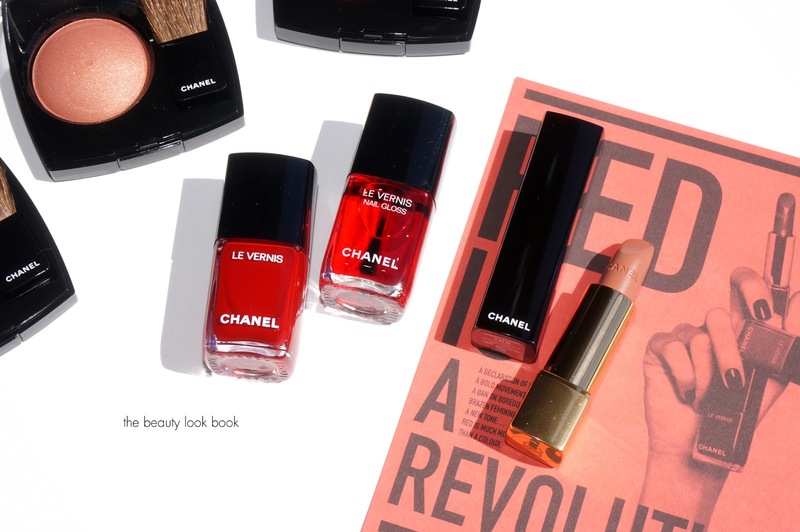 You can find both the Le Rouge Collection N°1 and Ultrawear Flawless Collection online at Chanel.com. By now I’ve spotted both in store near me. Also available online at Nordstrom, Neiman Marcus, Saks Fifth Avenue and Bloomingdale’s. Have you checked out Chanel fall bits yet? What did you think?